Do You Want to Murder a Snowman? Speaking of wastes of lovely nights, the reason this is going up so late is because instead of writing it last night, I went to see a movie. Now that in and of itself is not what was a waste. I forking love going to see movies. And now that I have a MoviePass (still not sponsored, plz MoviePass I love you), I will genuinely watch ANYTHING. Listen, I think of myself as a pretty mature person. HOWEVER, you can't just name a dude Harry Hole and expect me NOT to laugh every time they say it. I mean, COME ON. Who does that??? You coulda named this dude anything, yet you chose Harry Hole. HARRY HOLE. Pleaseeeeeeeee. The whole plot of this movie was that ladies kept bein' murdered, and they usually had a kid, and there was always a snowman outside the place they were murdered. 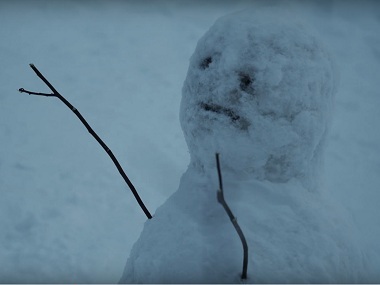 I just wanna take a slight detour to talk about how ridiculous the snowmen were. They all looked like they were silently judging me for being there in the theatre, knowing there were better things I could've been doing. Just a li'l pained and exhausted, and they're sitting there sad that they're a part of this mess. Eventually, the movie thankfully ends and you find out who the murderer is and it barely even feels like an ending because, despite what the billboards want you to believe, there weren't any clues??? But there was JK Simmons with a weird Norwegian accent, so who's the real winner here. Were there any winners??? Certainly not Harry Hole with a name like that. I'm sorry, I promise I'm mature, but Harry Hole sounds like a fake name from a dumb comedy movie. I was certainly not a winner either. They never explained why the fork the murderer had a thing for building snowmen. They made a big deal about these weird li'l tablets the police had, only for it to never really pan out into anything. They also made a big deal about the fact that the killer only murdered women WHEN it was snowing, but they never explained why I should give a shirt about the fact that it had to be snowing for the person to feel in the mood to murder. I don't know what to tell y'all, except that maybe don't see this movie?? ?